In case you hadn’t heard, last fall we brought to an end Blood ‘n’ Thunder‘s 14-year run as a periodical. The zine went out with a bang: a double issue numbered 49/50 and packed with some of the best articles in BnT history. In the editorial we promised to continue the franchise with a series of standalone volumes, issued at irregular intervals, covering various aspects of pulp and pop-culture history under the general title of Blood ‘n’ Thunder Presents. Well, this week we proudly release the first volume of Blood ‘n’ Thunder Presents, subtitled Pride of the Pulps. It’s been designed in the “deluxe” trade-paperback format of 8 1/2 x 11 inches, with the series title in a wraparound banner and the volume number printed at the top of the spine. All future volumes will have a uniform design. 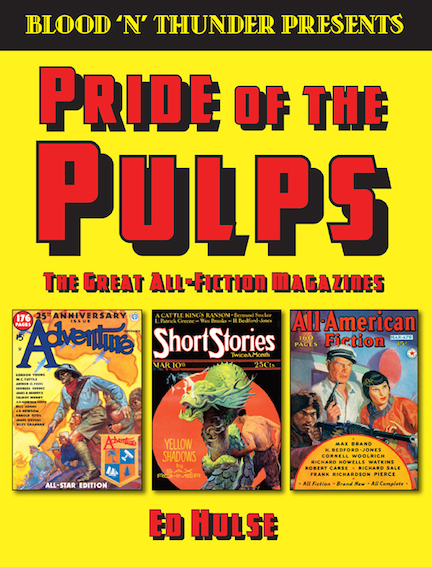 Pride of the Pulps devotes nearly 100,000 words to in-depth surveys of six classic rough-paper magazines: Adventure, All-American Fiction, Famous Fantastic Mysteries, The Popular Magazine, Short Stories, and West. Earlier versions of these overviews were published in back issues of Blood ‘n’ Thunder, but all have been revised and expanded for this book. Greatly expanded, in some cases: the essay on Short Stories, for example, first appeared as a two-parter with a total word count of 11,500 words. Its counterpart in Pride of the Pulps runs close to 17,000 words. The addition of new material extends as well to illustrative matter. The surveys in Pride include more pulp covers and interior illustrations than accompanied their earlier versions in BnT, but we’ve also added more scans of original cover paintings. In short, this is not a reprint volume that simply repurposes old copy. It has a significant amount of new content and is a veritable textbook of pulp-fiction history. Even if you’d be satisfied with the essays as printed in BnT, it would cost you well over $100 to purchase those issues individually. And that’s assuming you could find them all: the two issues with the Short Stories survey have been out of print for many years. Future volumes of Blood ‘n’ Thunder Presents will be devoted to the following topics: a history of Argosy, the working life of pulp writers, the output of legendary scribe Edgar Wallace, a history of Doubleday’s Crime Club book division, and a survey of films made during 1932, which we posit to be fantastic cinema’s best year. We hope and expect to issue at least two volumes per calendar year, although we’re on track to publish three in 2017. Stay tuned for more announcements. In the meantime, don’t miss out on our first release in the Blood ‘n’ Thunder Presents series. We guarantee it’ll make a valuable addition to any home library of reference works covering pulp fiction and vintage American popular culture. You can get it right here.